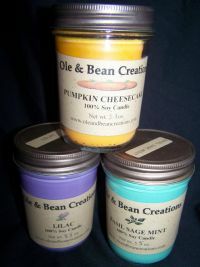 These candles are made with 100% soy wax. We only use soy wax & lead free wicks in these jelly jar candles! When properly burned, these will last about 50 hours. Lots of scent choices to pick from. Enjoy! Choose which three scents you would like.